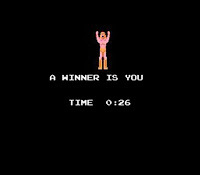 Donkeylicious: Scott Murphy: A Winner Is You! Republican Jim Tedisco concedes to Murphy in Kirsten Gillibrand's old House seat. A happy day for those of us who like further signs that people don't like Republicans. And maybe for those of us who like Engrish references to classic Nintendo games! King Slender looks a bit more like Murphy than, say, Starman or Kin Corn Karn do, so I put him up there. People were speculating before the election that a Murphy win might deliver a Back Breaker to Michael Steele's chances of remaining RNC chair. As much as I want to see turmoil on the GOP side, Steele is incompetent enough that I might be happy to keep him in charge. And to be less partisan, I can definitely appreciate Ta-Nehisi's point when he says, "I don't actually want the GOP's first major effort at ending the Southern Strategy to be a comic disaster." Having your black RNC chair go down in flames and get replaced with a dude who was in a whites-only country club until just before he ran for the position... that would be sad. You want to be in a country where both parties have gotten past the whole segregation thing. Steele has apparently been doing his job behind the scenes if not publicity wise. The RNC outraised the DNC in Q1, and has a lot more money on hand (as in, millions in the bank compared to millions in debt). So sadly, I wouldn't dismiss Steele so quickly. Also, seriously, the NY-20 race? I am so tired of seeing Democratic partisans act like they care about it when the seat was only vacated because of Patterson dumbly choosing Gillibrand. I'm very glad this is over. are DNC-RNC head-to-heads a good comparison? I mean, we're beating the GOP in fundraising 3-on-3. I remember that it's been basically this way for a while. Is there some kind of general dynamic where Democrats give to the legislative while Republicans give to the RNC? Sure it was dumb for Paterson to do that, at least from a help Democrats point of view. It gave us a weird test we didn't want. Then we passed the test. That's at least mildly neat.